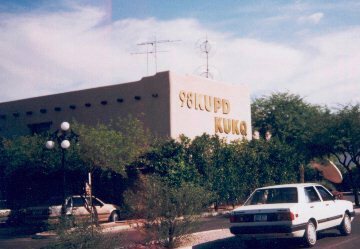 For many years, this Phoenix station was known as Top-40 KKKQ. The calls were changed to KUKQ soon after a switch to soul, funk and R&B. One day in 1987, KUKQ made an unannounced format change and became Q-Country. It was a surprise to even some of the station's own personnel -- but for the first time in three years, country fans now had a choice of two stations. and quite a few other statements. On October 24, the voice got down to "5-4-3-2-1-1-1-1...now-you-have-a-choice-of-mu-sic" and Camel Country 108 was on. KUKQ already had its work cut out for it competing against ratings giant KNIX 102.5. Now it had TWO problems. They could only take the heat for so long: less than five months after the Camel signed on at the top of the dial, Q-country rode off into the sunset. But greater things were in store for KUKQ: at 7 PM on April 12, 1989, they became one of the most innovative alternative stations the city has ever known. Suddenly, The Ramones were on the radio again. The Pixies, Dramarama, The Sidewinders, Timothy B. Schmidt, Elvis Costello and many other groups and artists got much-deserved exposure. The music had a certain charm to it when played on AM. It was as though the tunes they played were best suited for AM airplay. Jonathan L., Mary "The Bone Mama" McCann, Leah Miller, and a host of others brought to the valley a whole genre of artists that we never would have heard. It was too good to last. Competition on FM came in the early '90s when 106.3 The Edge signed on with corporate alternative. KUKQ switched over to a simulcast of FM 98 KUPD. The Q did come back briefly in 1994-95, but it had a harder sound and wasn't quite the same. After a brief try at being "KUPD 2" (and hosting Dr. Demento), they became all talk. Now owned by Sandusky Broadcasting, they are currently known as all-sports KDUS. A sad finale to a great station -- but on this page and in the memories of many people, the Q lives on. UPDATE: The Bone Mama became the Zone Mama! Well, not officially, but she spent a fair amount of time at KZON 101.5 before getting laid off in late '99. BACK TO MAIN Q PAGE!